11-year-old injured in hit-and-run crash in Indianapolis. 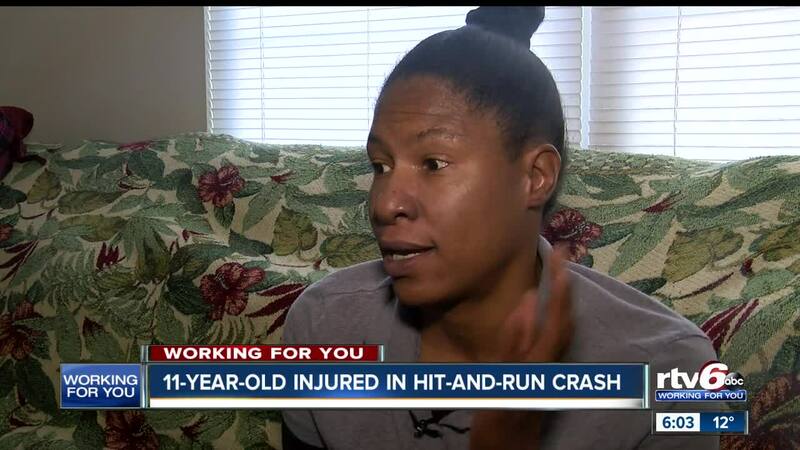 INDIANAPOLIS — Police are searching for the driver of a hit-and-run crash that occurred on the east side of Indianapolis. A crash that injured an 11-year-old girl. "When we were hit, all I could think about was my daughter's in the backseat," Rickonna Dixson said. Dixson says they were waiting on East Pleasant Run Parkway North Drive, to turn into Kroger, at the Twin Aire Shopping Center. She remembers looking in her mirror and seeing a truck behind her driving fast. The impact was so hard they were pushed into oncoming traffic, and then hit had on by a van, according to Dixson. "It damaged my car so bad. It's a miracle, really a miracle, that my daughter made it," Dixson said. "She has half of her ear missing. My car is totaled." Rickonna hopes someone witnessed the crash and will come forward to help police with their investigation. "This is wrong. You shouldn't hit somebody and not stop. Anything could have happened - we could have died. The car could have blown up," Dixson said. "You didn't check to see if we were OK. You could have stopped." Police believe the suspect was driving a 1997 black Dodge Ram. If you have any information contact Crimestoppers. If you are ever involved in a hit-and-run, State Farm Insurance recommends not following the driver. Make a police report right away, on the scene, and try to get as much information about the make and model of the vehicle leaving the scene.